We arrived in Denham, the most Westerly town in Australia at about 7pm after a long drive down from Exmouth with a couple of roadhouse stops on the way. Denham is a small town within the Shark Bay World Heritage centre. 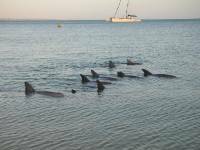 As well as sharks the peninsula is home to the famous Dolphins at Monkey Mia that come and feed off the beach each morning and also 80% of the worlds Dugongs (mermaids) that feed off of the sea grass found in area. As we arrived quite late we decided to take a quick walk along Denham foreshore, it was really windy and so quite cool even though the sun had not yet set. We grabbed a couple of beers from the bottle shop before heading back to the campsite to make some dinner. The following day we decided to go to Francois Peron National Park, but once we got to the park headquarters we found out that we could only visit the majority of the area if we had a 4x4 and we did no want to risk getting stuck in Holly. It was a bit disappointing as we thought that the park looked a nice area from the brochures we had collected. Instead we took a drive to Ocean Park a rehabilitation unit for the area. We were taken around by a guide and shown the local tropical fish that swim the area. We also saw some baby turtles that had been rescued and brought into the centre to recover before being released back into the wild. We learnt that the venom of the sea snake is 4 times more stronger than that of any land snake and that there are plenty found in this area, although it was a bit of comfort to know that they can bite and choose whether to release their venom or not, although we did say that we'd rather not risk meeting one. We also got to see a pool of stingrays, snapper and emperor fish being fed. We then moved onto the main attraction the Shark tank. 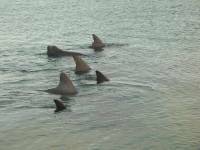 There were about 4 species of shark with the pool, their dorsal fins hovering under the water. The guide wanted to show us how they fed, so a fish was held over the water tied to the end of a piece of bamboo with a string. 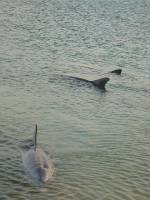 This was then held over the sharks and we waited until one lurched out of the water to take it. Sharks do not eat very much and are able to conserve their energy very well so the idea of the fish being tied to the bamboo was that it would not be able to eat it, however the teeth came out and the jaws opened and the fish had gone pretty spectacular. The closest I ever want to get to a large live shark thats for sure! Our next stop was a cliff top called Eagle Bluff overlooking the small Eagle Island and the the World Heritage area. As well as the spectacular view from the cliff this is also a good place to go shark spotting. We stood up on the boardwalk for a long time trying to make out if the shadows were in fact sharks or not. We are sure that we spotted about 8 long shadows moving along just under the surface, it was strange that even though we were high up we could make out the shark shape because of the way it moved. We are not sure of the size as we were quite a distance away but we are sure they weren't babies! We moved on so that Wayne could do some fishing. We stopped at a place called little lagoon, which had turquoise water but when we tried to fish found out it was too shallow so we moved back to Denham town to fish off of the pier, where we joined about 4 families showing their children how to catch tea. 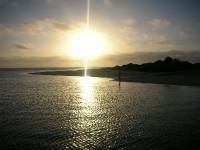 We didn't catch a thing so we gave up and cooked ourself a chilli on the foreshore and watched the sun set over the water before driving to the purpose built Monkey Mia resort so we could wake early and see the dolphins. We were on the beach by 7am the following morning, there were already people milling around, but we were in luck we spotted some dolphins just off of the pier so we walked along to watch them swim just offshore in the bay. 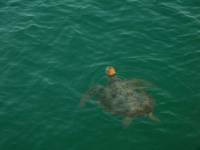 As we were on the pier we were even more lucky a turtle popped it's head out of the water just in front of us, it was massive. 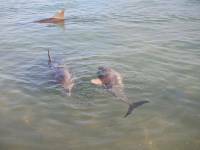 Within 15 minutes a small area of the beach had got much busier and we joined the ranger just at the edge of the water as the dolphins came closer. They were lovely although I was quite surprised that so many of them had chunks missing out of their fins, apparently war wounds from encounters with sharks. 12 dolphins came in to feed today which was apparently quite a lot as the previous day they only had 4. Each of the dolphins is named and the the ranger remembers all of them and who they are related to. All of the dolphins continued to swim up and down the beach rolling over and poking their bottlenoses out of the water at us, they were not at all phased by the number of people just staring at them. After a brief introduction a few more rangers and volunteers arrived with buckets of fish. 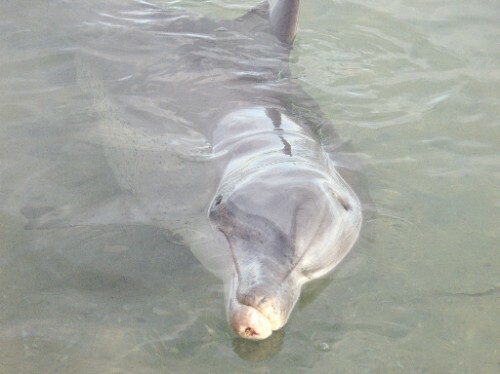 A few people from the crowd were asked to come forward and feed the fish to the dolphins, one of the dolphins even had a specific species of fish as she was fussy. It did not take long for the females to eat all the fish, males are not fed and there is a set quota for the females so that they do not become dependent and still hunt for their own fish during the day. It was a good experience to be able to see wild dolphins so close although it was a shame that there were so many people there although I suppose that this is what the area is famous for so we should have expected a lot of tourists just like ourselves.